At TAOS Gifts, we have a wide range of fun, creative giftsfor children of all ages. Our Paint your own plaque kits come with everything they need to create a wall plaque for their rooms, the kits contain a sign that says either Monkey, Princess, Keep Out or there’s a Blank one for them to create their own message. Each wall plaque comes with a paintbrush and paints. There are other Paint your own gifts in stock including fun money boxes to encourage saving, a flower-pot for budding gardeners, a photo frame for photographers and much more, have a look at our educational toys section for some inspirational ideas! Wooden French Knitting kits in bright colours and attractive designs including the Father Christmas Santa French Knitting kit or the Pink Princess French Knitting Kit are ideal gifts for Christmas or Birthdays that will get them making their own imaginative creations in no time, French Knitting is quick and easy and they’ll love watching their creations grow through the bottom of the knitting dolly. Each kit comes with elasticated yarn making it easier for little hands to get started, the knitting dolly, a tool to hook the yarn over and full printed instructions. french knitting is easy to do, the lengths of yarn are threaded through the hollow body, winding around the 4 metal pegs on top and unhooked using the special pencil like tool, producing a braided cord through the middle. Potential fashion designers ill love creating magnificent, colourful patterns on fabric with the Fabric Tie Dye Kit. T-shirts, bags or cushion covers can be wrapped, twisted and tied using the specially shaped plastic tools and then dyed in specific areas with the three-bottle applicators. There are three designs available, each one providing different tools to produce a distinctive design either spirals, waves or stripes. The finished results are permanent and the whole process, including the potential to mix different dye tablets to create new colours such as purple, pink and green. It’s educational and fun, suitable for boys and girls over 6 years old (adult supervision advised). You will also require need fabric, water, large plastic bowl or tub and a sealable plastic bag. Building is easy with CLICS a tough, durable and colourful collection of building blocks, suitable for 3 years and upwards with various kits available, there is no limit to what they can build. CLICS are coloured plastic building blocks that clip together to form hundreds of different models, produced in bite-proof safe polypropylene, CLICS are durable and able to withstand prolonged use under all conditions. Get them started with this fun 3 Trains CLICS set, they can make a Steam, an Express and a Goods train, with fun metallic colours they are fully compatible with all the other CLICS sets. There are also practical 400 Piece Wheely Roller Tubs available in either Green or Pink with Girly Glitter CLICS, with their chunky wheels and handles they are easy for little ones to move around and to store their fantastic CLICS creations safely. Growing your own Herb garden, fruit and other tasty treats is so easy with the Grow your own kits at TAOS Gifts. Grow delicious Strawberries (Fragai Ananassa Duchesne). The pot comes complete with everything you need, you don’t need a large garden to get started, the pot fits easily onto a window sill or ledge, so easy to grow even if you don’t have a garden at all. The Grow your own kits are also an ideal introduction to gardening for Children, they’ll love their home-grown fruit and have great fun learning to care for their plant while enjoying the tasty reward for all their efforts. The Grow Your Own Strawberries Kit contains artificial soil, Strawberry seeds, full instructions and a Decorative red plastic pot. Simply fill around 3/4 of the artificial soil in the pot and put it onto a saucer. The black foam inlay (included in the box) needs to be put down for the seeds to be spread, then fill the rest of the pot with the remaining artificial soil. The Pot must then be positioned in a hot sunny place, water regularly and the first seedlings will grow after around 18 days. Just as easy to grow are the selection of herbs, with a similar kit but supplied with a green pot so it will be easy to identify your seedlings, you can choose various herbs such as Rosemary, Thyme, Basil and Oregano to enhance your cooking. Give your green fingers a break with a short coffee break, there’s nothing quite like freshly ground coffee, especially if you’ve grown it yourself! The Grow your own Coffee Plant Kit comes in its own Expresso China Mug with everything you need to grow your very own coffee plant. Perfect gifts for Coffee loving gardeners! Movie lovers are not left out, there’s no excuses for them not to get involved, with the Grow your own Popcorn Plant Kit they can have a go at growing their own movie time snacks! Real popcorn in a bag – just add a pot and water! The sweetcorn has to be fully dried (on or off the kernel) before it can be used as popping corn. The kit comes with seeds for Zea Mays corn, which is a special hybrid of corn, and is the most commonly used corn for popping. All you need is water and sunlight to help your plant grow in to a corn plant as corn plants need very little nurturing to grow. Grow your own kits at TAOS Gifts are ideal gifts for any occasion! We now have three new additions to our Tinti Bath Fun ranges which really do make kids bathtime fun. 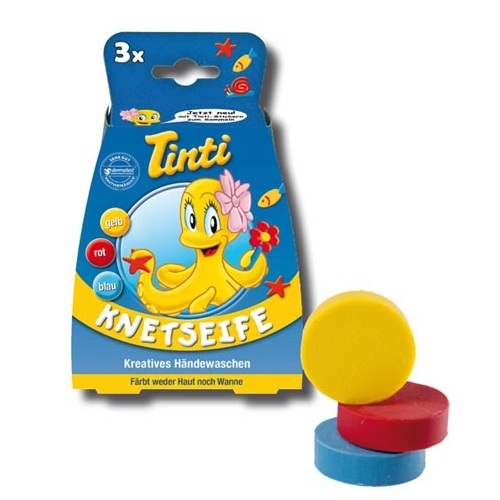 Tinti Kneading Soap all the fun of playdough without the mess, and it cleans their hands at the same time too. Three small round bars of kneading soap included in each box. One each of red, blue and yellow. Tinti Bubble Bath this red coloured foam bath will produce mountains of tiny bubbles, and it colours the bath red at the same time. Use as little or as much as you like this large sized 150ml bottle is enough for up to 10 baths and great value for money. Tinti Painting Soap now in a great value gift box. Three 70ml painting soaps included, one each of red, blue and green. Use one colour of the Painting Soap at a time or mix the colours to create new exciting colours. Clean, messy fun, that will not stain the bath tub, skin or hair! Now the biggest trouble you will have at bathtime is getting your children OUT of their Tinti bath.